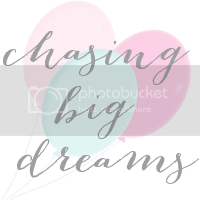 Chasing Big Dreams: New Product + a Giveaway! New Product + a Giveaway! The TORI necklace has layers upon layers of frayed chiffon with a small shiny gem in the middle of each flower. The flowers are securely placed on a white grosgrain ribbon. This allows you to wear it at the length that is most comfortable for you. 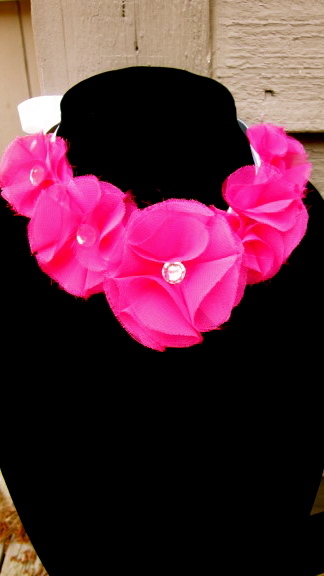 Available in 13 color choices! I've been wearing this necklace around for the past week and boy, oh boy, was I blown away by the response of my local customers, family, and friends. A stranger even offered to buy it right off my neck! So with that being said, I'm having my very FIRST giveaway. I'm giving away not one, not two, but three TORI necklaces. (valued at $25 each!) And guess what? I'm letting the winners custom design theirs. Even better right? That's FIVE chances at winning a free necklace! Giveaway ends next Tuesday Night at 12am. 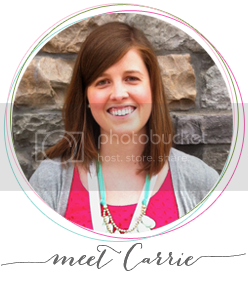 I follow Caroline g. Dream blog! i am a fan AND i follow! I follow this blog! I follow on twitter and Liked you on Facebook, and shared it on my Facebook page! And I'm about to tweet the giveaway. WOOP! Love the necklace and excited to follow the blog! whoop whoop! this is the winning entry right here folks. I'm shocked at how many of these ways I already follow you. I had no idea. I am a new follower - over from vintage wanna be - love your shop! thanks!